So last week I mentioned the other projects I decided I needed to do in the midst of holiday preparations. You know, all the things you’ve been putting off or didn’t even notice before they suddenly seem urgent. One of them was repainting my former kitchen cupboard door turned shutter above my fireplace. You might remember that I had originally painted it blue because I didn’t have any primer. We were having company over that night and that was all I had on hand that would stick to the cabinet like primer. As luck would have it, I ran out of time to paint the third shutter a top coat of white like the others so it had to stay blue. Whatever. So, while the middle shutter was a lovely shade of blue, after a few weeks of living with its blueness it just wasn’t working for me. I did like the idea of the third shutter being a color instead of white though. So, I got out my new favorite green paint mixed with some brown toner and voila, I now have an aged green shutter. Still haven’t painted my swine walls (OINK!) and I am still considering fabric to possibly slipcover my chairs and ottomans, but I am much happier overall now just having my green shutter. It doesn’t take much to make me happy. Decorating is definitely a slow process of pulling together what I have around my house. Picking out everything from scratch before I even began would be easier, but I enjoy the challenge of making things work as I go. So, there you have it, the mantel and its touch of Christmas. To keep it inexpensive and simple, I used mostly things I already had…my HomeGoods lanterns, old garland, my Pier One apples from fall, and clear glass candlesticks to hold up my blue glass ornaments. And I finished it off with a natural twig wreath to balance out the pretty and round out the rectangular shapes. That wreath will work all winter. Some of you asked about the stockings when I showed them last week. They are Pottery Barn but I added some of my grandma’s doilies to the girls’ stockings to pretty them up and make them unique. Easy peasy. No sewing either, just tucked them around the cuff. Coming up, home tour and more Christmas decorating from around the house and around the web! Your mantle looks so nice and fresh. Wish I was that far along in the process…maybe today is the day. …lovely…perfectly lovely…just exactly what Christmas should be…. After seeing your door above your mantle, I’m thinking about trying my old door above ours. I blogged about my old door last week. I think it might be worth seeing how it looks. Thanks for inspiring me!!!! I had a feeling those stockings were pottery barn! darn! So pretty! Love how your mantle pulls together all the rest of the colors in your room. .-= Stacy @ Red Door Home´s last blog .. =-. It’s BEAUTIFUL Larysa! I SO wish I had a mantle to decorate! .-= TidyMom´s last blog .. =-. Your home is lovely, like something out of a magazine! Your mantel is beautiful! I love the white stockings. .-= Courtney´s last blog .. =-. It all looks so lovely and as if it belongs! Looking forward to seeing what you pull together this season! .-= Jennifer´s last blog .. =-. What a gorgeous mantel!!! Happy week! * G’ mornin’! Your choice of colors n’ textures here is just wunnnaful!!! It’s SOOOO CHARMING & the look is so beautifully fresh!!! So glad you shared this with us!!! I really love the color scheme. Nice! And I love the simple wreath hanging above the mantel. Very sophisticated. .-= LesleySW´s last blog .. =-. Beautiful! I love me some symmetry on a mantel. Great colors, too. .-= Katie´s last blog .. =-. Oh Larysa, it is just gorgeous…you are so talented!!! .-= Lisa Marie´s last blog ..NaUghTy oR NiCe =-. Great color combination (one of my favorites): Mediterranean blue & apple green, balanced by clean white. And you make it affordable by using what you already have. It looks lovely! .-= Michelle, Home Staging Pro´s last blog .. =-. .-= Flower Patch Farmgirl´s last blog .. =-. So so pretty and calming. Love the wreath and the stockings. i just put a little personal touch on mine too. Really makes a difference. Just gorgeous…. .-= Nancy´s last blog .. =-. I think your mantel turned out lovely. I am in love with those green apples….so fresh looking! .-= Tammy ´s last blog .. =-. Your mantel just proves simplicity = gorgeous! Looks like a front cover page for a magazine. Thanks for sharing. Oh, it’s just so pretty and fresh looking! I love it! What a light and pretty mantel! I’m working on mine today. Love your mantel! the combination of colours works really well – great idea the “green’ shutter!!! .-= Gena´s last blog .. =-. That’s beautiful, Larysa! I really love it. .-= Living With Lindsay´s last blog .. =-. This is so pretty! I love the colors and the wreath! .-= Stephaine @ Geezees´s last blog .. =-. Beautiful! Simple and gorgeous–an unbeatable combination. I really like the shutter idea on mantel- I’m thinking about coping that idea for my mantel- thanks for all the idea- it’s always fun here. This is so pretty. It’s a refreshing change from the over doneness of some of the decorations out there. .-= Puna´s last blog ..December 4, Oh Christmas Tree =-. You are amazing as always….. I love the cabinet doors turned shutters…I also love the simplicity of your mantle… So pretty! .-= Loulou´s last blog .. =-. .-= beth´s last blog ..Feeling festive =-. It’s so pretty! I love the green and white with the addition of the aqua ornaments. .-= Holly´s last blog .. =-. Larysa, it all looks gorgeous! I love the simpleness and the addition of the shutter and my fave part, the blue balls on top of the candlesticks. Just that pop of color is perfect! Merry Christmas to you and your family! .-= Rhoda @ Southern Hospitality´s last blog .. =-. I LOVE those stockings! I really like to change somethings from year to year, but I think the stockings should be the same…I love that at my parent’s house I have had the same stocking all my life! I have been on the hunt for good white ones that would fit in with whatever color-scheme I am feeling…and the addition of doilies – how perfect! Thanks! .-= caitlin´s last blog .. =-. I love that it looks like a natural extension of the rest of your decor, soothing and quietly beautiful. Enjoy! .-= 31everything´s last blog .. =-. .-= clarice´s last blog .. =-. .-= [email protected] Porch Musings´s last blog .. =-. I love the doilies-it really makes them look special. And your mantel looks very pretty too! Absolutely beautiful! When I grow up, I want to be just like you. Thank you for providing a window into your holiday world. .-= Shannon at Old World Charm´s last blog .. =-. It looks just perfect! I love the blue shutter, adds so much character. .-= Larysa´s last blog .. =-. I love the mix of the green apples and blue ornaments! So fresh and pretty!! .-= Stacey @ The Blessed Nest´s last blog .. =-. This is so pretty. I love the winter white stockings. Makes me want to redo mine. Maybe next year. We have added family members over the years so now I could justify new stockings that coordinate better. I also like the simplicity of your mantel. So often more is more when it comes to the holidays but here you hit it just right. Yay you. .-= pam rosenberg´s last blog .. =-. Your mantel looks great, love the green! I have the same stockings, love this idea, I have been wanting to “girly” them up and your idea has me wheels turning! .-= tammy @ tinselshop´s last blog .. =-. Looks great. I LOVE the white stockings! .-= Jocelyn Stott´s last blog .. =-. I thought I was going to PASS OUT when I saw your lovely…oh so Coastal Living mantel! I thought it had to be one of your beautiful magazine shots! Will you come to BAINBRIDGE and decorate my house? I am sad I no longer have a mantel in our new home! Such a focal point in the room! The PB stockings…MAKE IT! Scrumptious! What a lucky family you have! In my innocence, I bought a wreath for my front door the other day and when I went to hang it I discovered that it wasn’t a door wreath, but a centrepiece wreath! So I got a new one for my door today and it looks great – maybe I’ll post a photo on Passementerie in the morning. .-= Passementerie´s last blog .. =-. .-= Heathahlee´s last blog .. =-. That’s just lovely. So peaceful and understated. I’m still stepping over boxes trying to unpack all my decorations. .-= Carolyn´s last blog .. =-. It looks lovely, Larysa :) So glad you’re “home” for the holidays this year! It’s nice to own. .-= Myrnie´s last blog .. =-. .-= Pat´s last blog .. =-. gorgeous!…I don’t have a mantel, so I posted about my Christmas $60 Target bookcase! .-= Aaron´s last blog .. =-. It’s lovely, Larysa. I love that color you finally landed on for your shutter. And I’m like you: working things in as I go. This wall knockout in our living room has the whole house upside down as I borrow from each room to try to make this one right. It isn’t there yet…but we’re getting closer! .-= emily´s last blog .. =-. Love it! 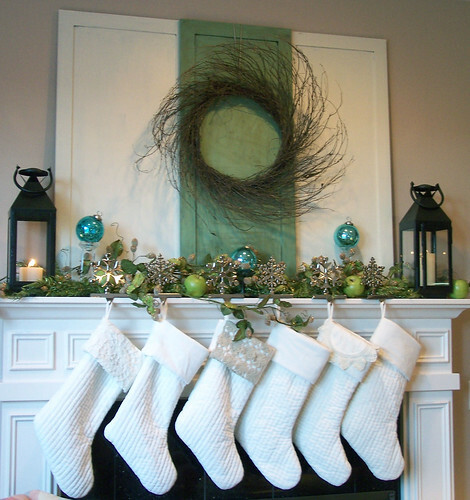 I love the idea of dressing up the pottery barn stockings with Grandma’s doilies. Mixing the new with the old….perfect! I’m liking those (oink) walls! The mantle swag, the wreath (!! 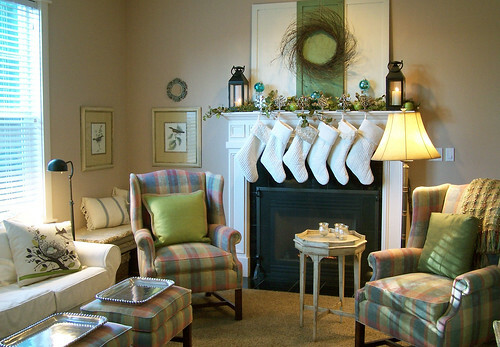 ), the stockings — truly, your ingenuity and creatitivy make a beautiful home…. and inspire us all! .-= Ann [email protected] Experience´s last blog ..Filling the Sky of Twitter with God-Praise? =-. My question is this: Where do you purchase a stocking hanger like the one you have? .-= annie´s last blog .. =-. That looks fantastic! So fresh. Well done!!! our house is missing the festiveness this year. i have just been too darn busy. maybe i can get a few things out today? we’ll see. .-= meg duerksen´s last blog .. =-. Love the pieces of wood you added behind everything!